Our ball recaptures the gala evenings enjoyed by the Ali‘i and honored guests of the island during the reign of Hawai‘i’s King David Kalakaua (1874-1891), who earned the title of “The Merry Monarch” through such lavish and joyous events. Set against the backdrop of a beautiful Hawai‘i evening, our guests will arrive and be greeted by music of the favorite compositions of King Kalakaua. The King’s Guards, sharply dressed in their royal blue, gold and white uniforms with kitchener helmets and springfield drill rifles will serve as sentries and escorts, adding a dramatic and colorful touch to our evening. White gloved waiters will circulate passing trays of Hors D’oeuvres and libations from the bar. After all our guests have arrived, a conch shell note signals the imminent arrival of the King and Queen with their Royal Court. 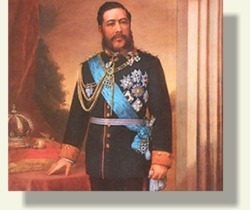 King Kalakaua will formally greet his guests, with the King’s Guard and Royal Court leading the procession to the dining room. Once inside, as our musicians play, the evening continues with dancing, feasting and entertainment.